Chapman Templer was working at a local bike shop, unsure when or if he’d ever get promoted or earn more money. After two years at Tires Plus, Chee Vang was struggling to pinpoint his long-term goals. Jordan “Monk” Nicholson was writing comic books and looking for a full-time job after recently moving from Ohio to the Twin Cities. They and a dozen other job seekers who entered the Metro Transit Technician training program last fall now have a much better idea of what their futures could hold. The second group to enter the industry-first job training program was celebrated last week at the Blue Line’s Operations & Maintenance Facility, where participants had spent the past several months studying electrical theory and learning from the Electro Mechanic Technicians they aspire to someday work beside. That experience was accompanied by tutoring and empowerment training with instructors at Twin Cities RISE!, a Minneapolis-based non-profit that helps individuals overcome barriers to employment. 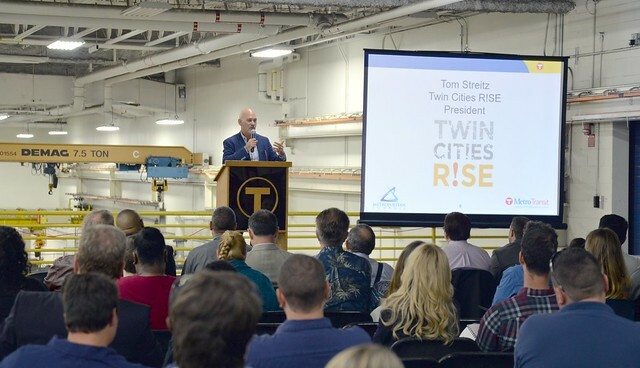 Last week’s ceremony came at an early crossroads for the participants: on Monday, they began full-time, paid Metro Transit internships and classes at Hennepin Technical College, which has developed a new degree program centered around Rail Maintenance. While lots of hard work remains, supporters said the confidence and skills the participants had already built needed to be recognized. This is the second group to enter the training program, developed by Metro Transit in partnership with the Amalgamated Transit Union Local 1005, Hennepin Technical College and Twin Cities RISE! Participants from the first group are now entering their second year in college while interning in service garages and preparing to apply for full-time roles in Bus Maintenance. Applications for a third round of the program, again focused on Bus Maintenance, will be accepted later this year. For participants like Vang, the goal is to land a career that promises stability, good benefits and opportunities to advance. For Metro Transit, the hope is to rejuvenate the ranks of technicians in bus and rail maintenance amid retirements and system growth. Metro Transit will need to nearly double the number of technicians maintaining light-rail vehicles, signals, and systems to support planned extensions of the Green and Blue lines set to open in the years ahead. At the same time, around half of current technicians are above the age of 50 and beginning to approach retirement age. “We’re very excited now to be growing our own technicians,” Chief Operating Officer Vince Pellegrin said. The program also supports Metro Transit's ongoing efforts to build diversity and provide access to opportunity. Included in the most-recent group of participants was Ashley Williamson, who is on a path to becoming the first African American female to work in Rail Maintenance at Metro Transit. “This is a major accomplishment to be able to inspire the next generation of people who are like me,” she said. Electro Mechanic Technicians Resha Petit and Ben Engen said learning about participants’ histories is part of what made mentoring them so interesting and rewarding. They also appreciated the eagerness the participants showed throughout the 120 hours they spent working in the shop and studying with instructors. Participants in the Metro Transit Technician training program celebrated last week include, from left to right, front row: Calvin Hill, Allan Vang, Annette Kavanaugh, Chee Vang, Christopher Dudzinski, Thao Xiong, Toua Yang. Back row: Ronald “RJ” Abellard, Caitlin Wagner, Chapman Templer, Tenzin Kunga, Terence Ealy, Ashley Williamson, Jaime Trujillo, Jordan “Monk” Nicholson.